You can quickly locate clients, files, and folders in the Connected Desktop. 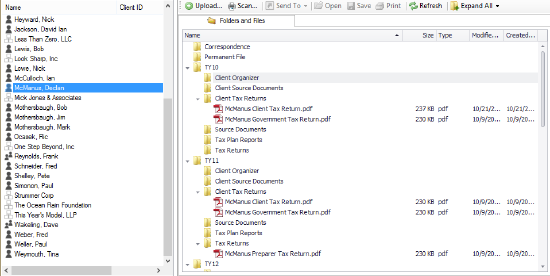 When you start to import all your documents and client data, you'll need the following tools to help you search through the Connected Desktop. When you work with documents in the Connected Desktop, you'll locate your client and then search for files or folders in your client's vault. 1. In the search field, enter your client's first or last name. Note: Your list filters as you type. 2. Click the x icon to clear the search field and display all clients again. Alternatively, you can use the quick search to find a client. 1. Click within the Client List to make it active. 2. Begin typing the letters in the client's last name. For example, if you are looking for Carl Sagan, type "Sagan" until the client record for Carl Sagan becomes active. Note: Folder structures will vary depending on your plan (tax or non-tax) as well as the engagements you have selected. While the functionality is the same across both plans, these screens apply to a tax accounting plan. 1. Click on a client to open that client's vault in the Document View. 2. 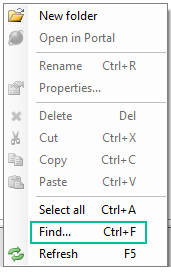 Right-click anywhere in the Document View and select Find. The Find tool opens in the Document View. 3. Enter any text to start your search. Your search results load as you type into the Find tool.